The most practical way to learn Qigong or Taijiquan is to regularly visit a school nearby and take part in the weekly courses. Many schools offer different courses (and time-slots) to choose from. Regular training at a regular time. Regular group with people you get to know by and by. – Maybe you will make some new friends, but if you are not into socialising you can just drop in for the course. Nice end of the day ritual. – Most courses will be in the evening, but If you are a shift worker or already retired, you could profit form a weekly morning session as a good start into the day. Regular repetition will help you to remember new information or new parts of the choreography more easily. 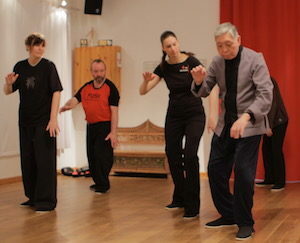 TIPP: If you are new to Taijiquan and Qigong, i.e. if you are beginning to learn a (new) form, going to courses twice a week is to be recommended. If you cannot find a school offering more than one course a week in your area or you are not able to attend more often than once a week, repeat the new movements at home at the same evening. Doing the new moves/repeating the corrected movements in another setting (room/situation) helps your body and mind to remember them better. There is practically no downside, but you will have to integrate your weekly course into your lifestyle. As with other sports, always thinking on going to exercise and then not going because you feel too tired or you cannot get out of your workplace in time does not lead anywhere. – It just makes you feel less comfortable. With that said, if you find you absolutely cannot fit a once-a-week course into your working life, even if you really want to, you should consider some elemental changes in your work-life-balance. The same goes for a family life that is so time-consuming that there is no “me-time” even of two hours a week left to care for yourself and your health.